Italian composer, born at Legnano, on the 18th of August 1750. His father was a merchant who died a bankrupt. Through the family of Mocenigo he obtained free admission to the choir school of St. Mark's, Venice. In 1766 he was taken to Vienna by F. L. Gassmann, who introduced him to the emperor Joseph. His first opera, Le Donne letterate, was produced at the Burg-Theater in 1770. Others followed in rapid succession, and his Armida (1771) was a triumphant success. On Gassmann's death in 1774, he became Kapellmeister and, on the death of Bonno in 1788, Hofkapellmeister. He held his offices for fifty years, though he made frequent visits to Italy and Paris, and composed music for many European theaters. His chef d'oeuvre was Tarare (afterwards called Axur, re d'Ormus), a work which was preferred by the public of Vienna to Mozart's Don Giovanni. It was first produced at Vienna on the 8th of June 1787, and was revived at Leipzig in 1846, though only for a single representation. His last opera was Die Neger, produced in 1804. After this he devoted himself to the composition of church music, for which he had a very decided talent. Salieri lived on friendly terms with Joseph Haydn, but was a rival to Mozart, whose death he was suspected of having produced by poison; but no evidence was ever forthcoming to give color to the accusation. In fact this "feud" is overstated, and certainly did not carry on to the extent implied in Peter Shaffer's film Amadeus (1984). 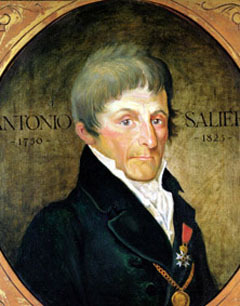 Salieri retired from office on his full salary in 1824, and died at Vienna on the 7th of May 1825. Salieri gave lessons in composition to Luigi Cherubini and to Ludwig van Beethoven, who dedicated to him his "Three Sonatas for Pianoforte and Violin", Op. 12.